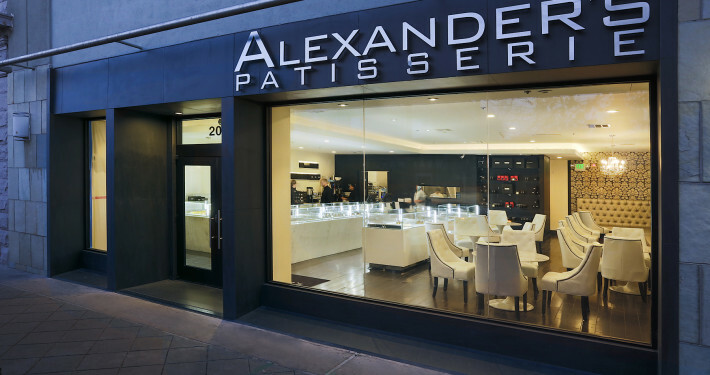 Alexander’s Patisserie is a relatively new addition to the city of Mountain View. 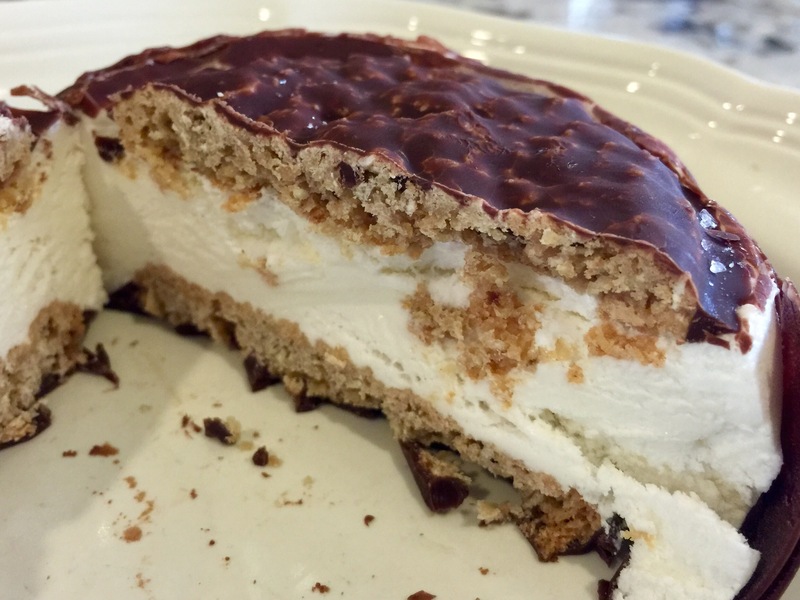 This high end bakery features all sorts of fancy things I can’t pronounce, and people are going nuts for it. 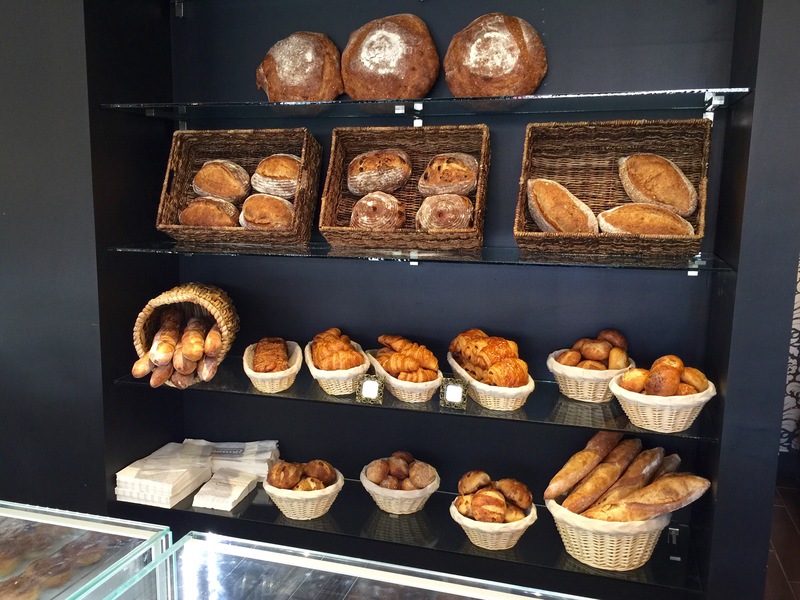 Although plagued with a number of “inventory problems” early in its lifecycle, this bakery has made a splash and, now that it has stabilized, seems to be here to stay. It may not be for everybody though. The Alexander’s brand started with a not-so-humble steakhouse in Cupertino, and their reputation for absolute culinary excellence has grown from there. I was pleasantly surprised to learn that Alexander’s was opening a bakery, but I remained skeptical. You see, I’m not a super duper fan of Alexander’s in general, mostly because overly-gourmet’d anything just kind of turns me off. I know, I know, blasphemy. Alexander’s makes plenty of tasty stuff that I love to eat, and I am always quite happy to enjoy a $180 steak at one of their outstanding restaurants, but they always seem to chef things up one step too far. The problem with Alexander’s in general is that I don’t really trust them. I feel like if I don’t keep a close eye on what they are doing in the kitchen, they are going to get crazy and put horrible things in my food. No, thank you, I would not like gold-leafed pygmy kangaroo spleen on top of my steak. Please just give me the steak and stop screwing around. I’m not sure if these are food or not… but they sure are pretty. Alexander’s Patisserie follows the same basic formula as the rest of the brand, and for the most part that is a good thing. This place is spotless. I’m talking surgical cleanliness here; I challenge even the most paranoid of germophobes to find fault in this place. I would have no problem eating off of the floor, and that’s the truth. The immaculate display cases are no exception to the hyper-neatness rule at Alexander’s, and the care put into arranging the displays is clear to see. 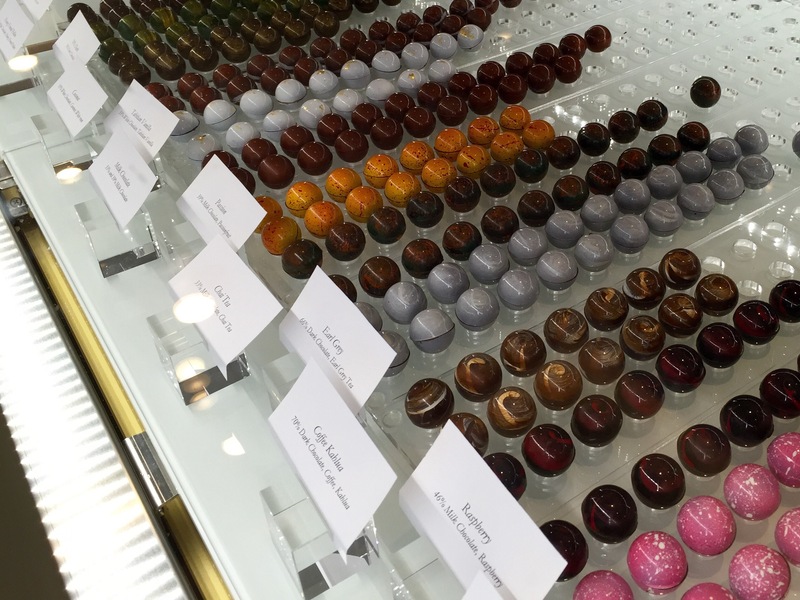 Speaking of the display cases, this bakery is truly a feast for the eyes. Never before have I seen such gorgeous baked goods in all my life; if nothing else, it’s worth coming here just to snap a few pictures. It’s impressive. Colorful little disks of macaron excellence. 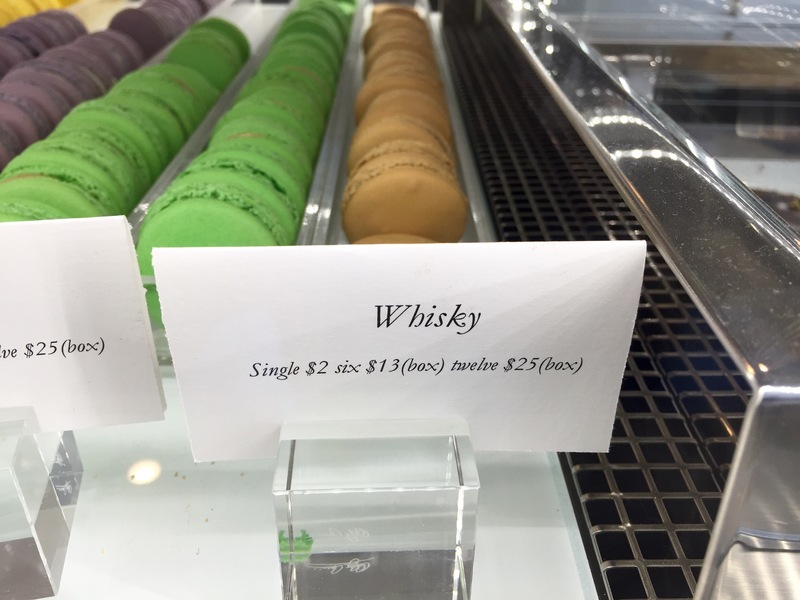 And yeah, ‘whisky’ is really a flavor. Over the course of several visits here, I’ve had an opportunity to sample a decent array of the bakery offerings, and for the most part they are all good. Not necessarily delicious or amazing or omg gimme that right now but just… good. As is their way, they seem to be in the business of taking extra steps in the kitchen to make things more fancy, but not necessarily to make things more delicious. Some people would argue that this is the very thing that makes Alexander’s special, but I’m just not that into it. It’s a still a great bakery though, no doubt. The quality is there, the presentation is there, the cleanliness is there, but one thing is missing: appeal. You see, the trouble with Alexander’s Patisserie is that it’s so high end it lacks charm. Polish and perfection have come at the price of personality. Nothing feels like it was ever fresh-out-of-the-oven; it all seems like it was assembled in a cleanroom by robots. There is no bakery smell, no wafts of warm air from a nearby oven, no hustle and bustle of busy bakers half covered in flour. Everything is neat and cool and highly processed. It’s nice, but it doesn’t tug at my heartstrings. The bread offerings are actually a bit disappointing. I hear the croissants are decent though. So far I haven’t done much besides bash on this innocent bakery, but there’s a good reason for that. I wanted to get all the unpleasantness out of the way before I focus on the highlight of this review. Truth be told, I really enjoy visiting Alexander’s Patisserie. More specifically, I absolutely love two things they make: lattes and kouign amanns. Oh yes, the lattes at this place are absolutely superb – the baristas truly know what they are doing. They’d better for the prices they charge, but I don’t mind the cost. In my book there is no such thing as too high of a price for a truly excellent coffee beverage, and Alexander’s does not disappoint. Major yum factor going on here. I’m a sucker for foam art. It automatically makes any latte 18.4% more delicious. What else was it that I mentioned? A keegoine-o-what? It’s called a kouign amann, and it is heaven on a tiny little pastry plate. I have no idea how to pronounce it of course, but that should not surprise you. If you’ve never heard of a kouign amann before (I hadn’t), it’s basically a rustic, lightly sweet, layered croissant-like thing. 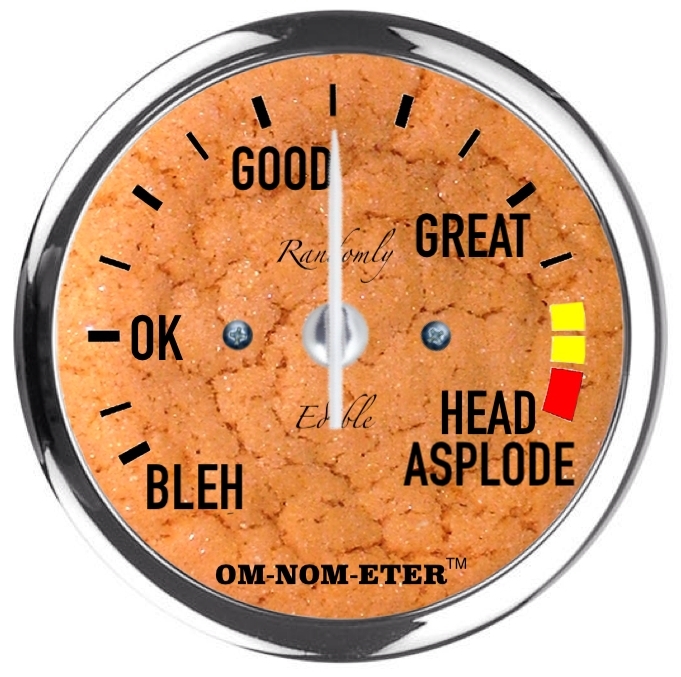 Apparently all the charm in the entire bakery has been focused into this one item, and it shows. The buttery, crispy layers of the kouign amann have just the right texture and softness as you pull them apart, and they go perfectly with one of those fancy lattes I was just raving about. 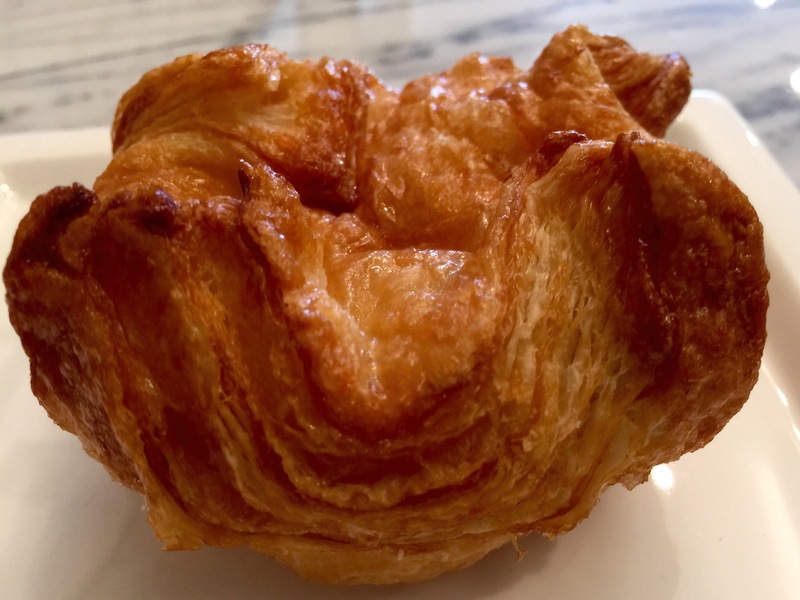 ‘Kouign amann’ is French for ‘Finally, something with character’. At the end of the day, Alexander’s Patisserie is a great way to spend 45 minutes on a Saturday afternoon. There are fancy expensive things you can take pictures of to impress your friends, and if you look closely you’ll find a few delicious morsels to eat too. 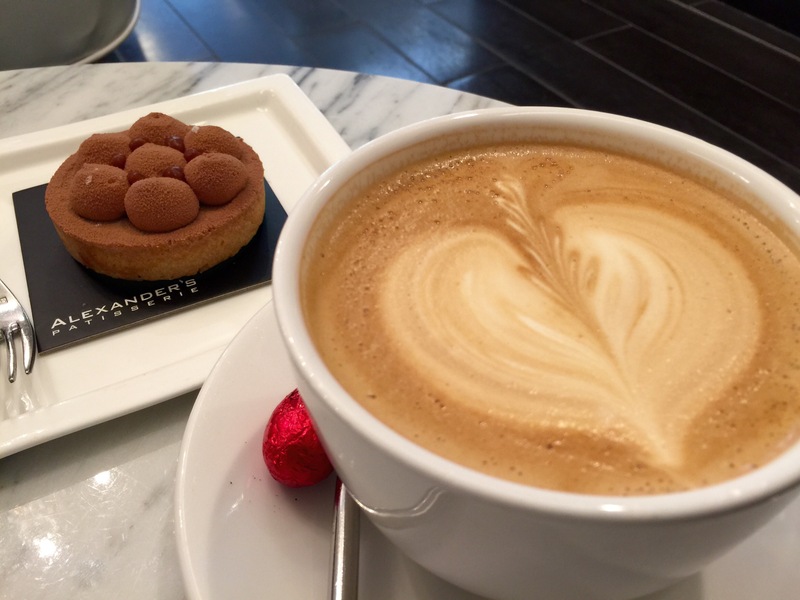 If you’re a fan of macarons, there is a good variety of flavors (and colors) to choose from, and of course there’s something here for coffee lovers as well. I rate this place 43 out of 50 robotically crafted shiny food spheres – above average but not spectacular. Alexander’s is good enough for an entertaining visit, but I don’t think I could ever truly fall in love with it. I’ll visit anytime for a latte and a kouign amann though. Like I said, it’s all fancy and stuff. I like to think of this recipe as a redneck twist on pumpkin pie. In truth, it’s a holiday twist on a popular redneck recipe, but let’s not split hairs. This decadent, gooey, decidedly bad-for-you dessert has become a holiday favorite among my friends and family, and it’s well on the way to becoming a tradition. Butter cake really isn’t a cake at all, more like a dense cake-pie hybrid; not even the most stoic pumpkin pie loyalists are immune to the allure of this stuff. Having been born and (mostly) raised in California, I had never heard of butter cake before a few years ago. All desserts in California are strictly forbidden by law to have flavor or calories, and they must also include organic agave syrup, Brussels sprouts, and lima bean flour. 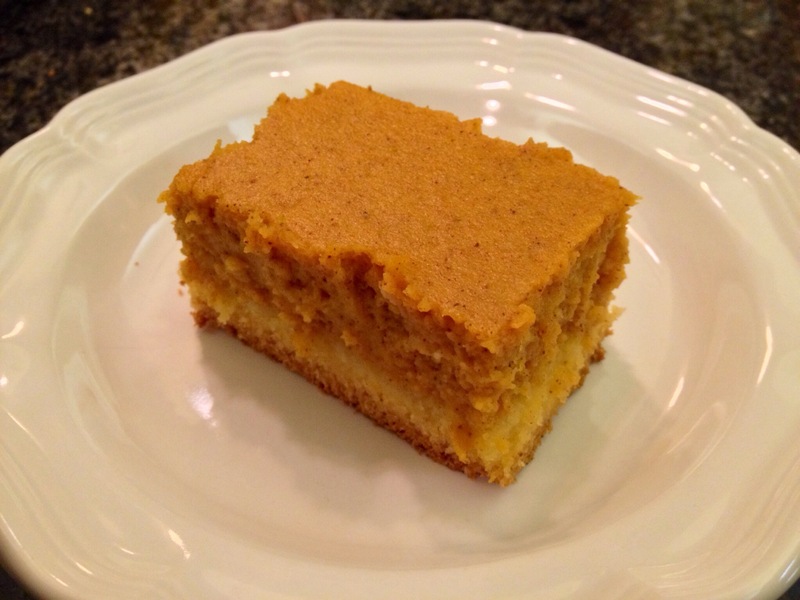 My spouse, a proud Texan, set me straight and introduced me to butter cake, and I have been a huge fan ever since. This particular recipe is essentially the same as Paula Deen’s, but with a couple of minor tweaks. 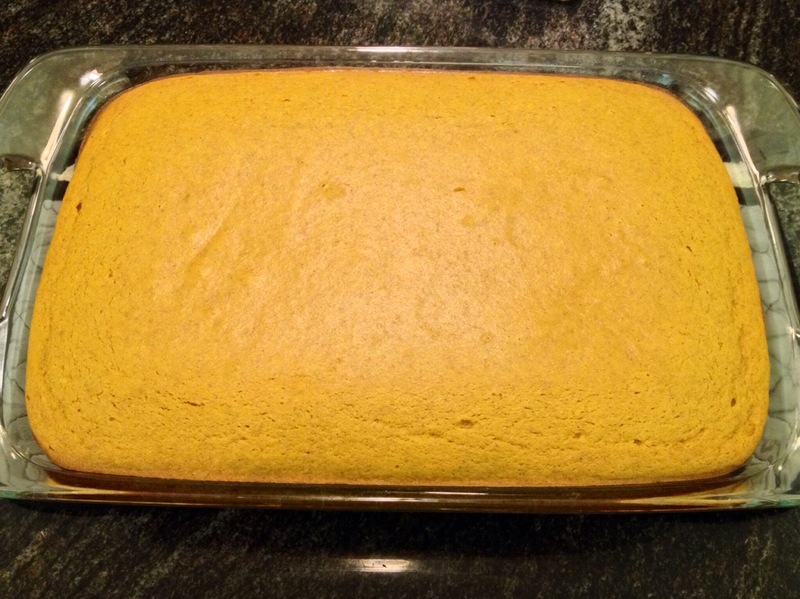 Preheat your oven to 350 degrees F. Open up the box of yellow cake mix and dump the contents into the mixing bowl. Throw the box away, directions and all. Feels good, doesn’t it? It’s fun being a kitchen rebel. Melt the stick of butter (30 seconds in the microwave will do the job), pour it into the cake mix, and give it a quick spin with the mixer. Add the egg and mix well. On a quick aside, you need to be careful anytime you are mixing any hot ingredients with raw egg. If you add one directly to the other, you run the risk of partially cooking the egg before it can get properly mixed in. Anywho, when you’re done you should end up with a bowl of thick yellow stuff the consistency of cookie dough. 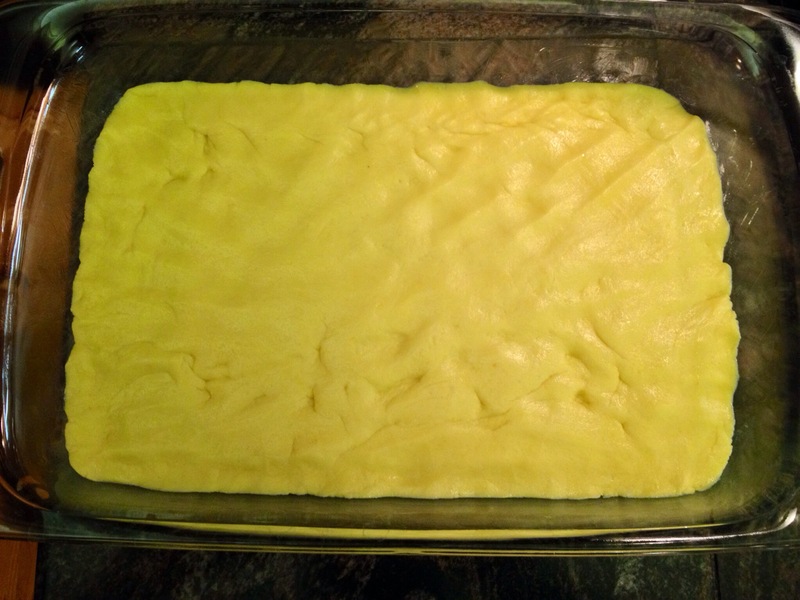 Lightly grease the 13×9 baking dish and press the cake mixture into the bottom in an even layer. You don’t need to be gentle – just smash the hell out of it and make sure it gets all the way into the corners. It looks like cake batter, but it’s oh so much better. Now it’s time to start working on the filling. It’s very important to make sure the cream cheese is room temperature at this point – it won’t mix right when it’s cold. You can attempt to carefully microwave it if you so desire, but I never like how it turns out. 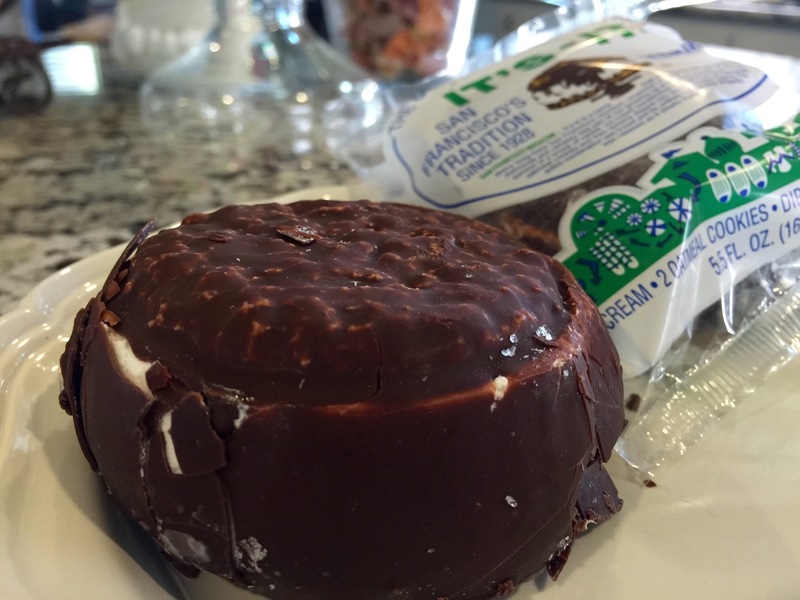 If you’re working with refrigerator temperature cream cheese, really your best bet is to just leave it out on the counter and go do something else for 45 minutes. Mix the (now softened) cream cheese and the pumpkin until well blended and silky smooth. Melt the butter and add it to the mixture along with the vanilla and eggs. In a separate bowl, whisk together the powdered sugar, nutmeg, and cinnamon – feel free to double up on the cinnamon if you like. I find that nutmeg tends to clump, so make extra sure there aren’t any nuggets of the stuff lurking around in the sugar mixture. Biting into a powdery pocket of nutmeg is similar to eating underarm deodorant; avoid this if you possibly can. Slowly incorporate the dry ingredients into the wet, taking care not to fling powdered sugar into the farthest corners of your kitchen. Pumpkin pie, eat your heart out. Pour the pumpkin mixture on top of the cake layer. Using the back of a spoon, “coax” the pumpkin mixture into the corners of the pan and make sure the whole thing is nice and level. Carefully place the pan in the oven and set the timer for 50 minutes. When the timer goes off, take the cake out of the oven. Don’t think, just do it. The cake will appear to be very liquidy, but don’t panic. Trust me. The first time I made this I thought I had completely screwed it up, but this is how it’s supposed to be. If you are using a glass pan, you will be able to see that the cake is nice and toasty brown on the bottom – that means it’s done. Resist the urge to bake it for longer and just let it cool for a while. It will set up nicely over the next hour or so. Nomming will happen very soon. Oh yes, very soon indeed. Slice it into squares, serve it with ice cream or Cool Whip or however you like it, and enjoy. 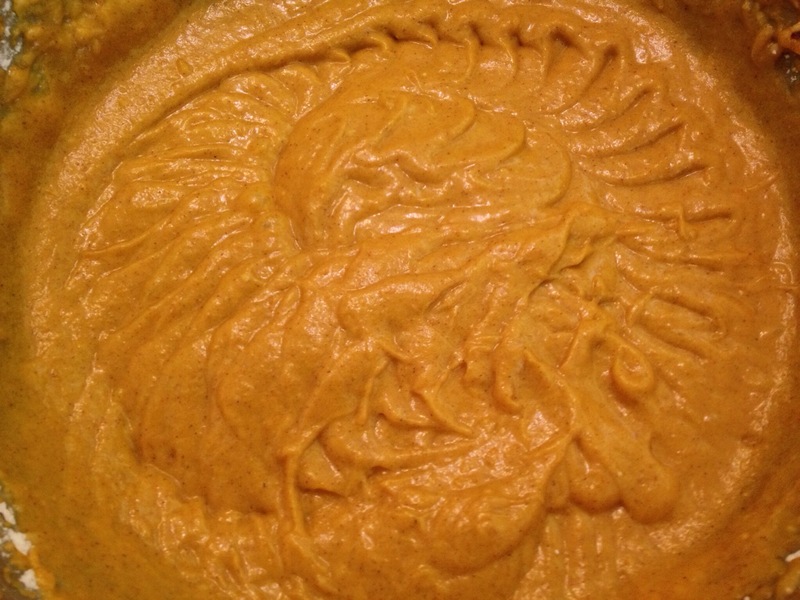 You may never buy another pumpkin pie again. I’m going to skip dinner and just have more of this. Preheat oven to 350 degrees F. Combine cake mix, 1 egg, and 1 stick of butter, melted. Press mixture into the bottom of lightly greased baking dish. Mix cream cheese and pumpkin until well blended. Melt remaining stick of butter and add to pumpkin mixture, along with vanilla, and 3 eggs. In a separate bowl, whisk together powdered sugar, nutmeg and cinnamon. Slowly add the dry mixture to the wet, stir until evenly blended. Pour into baking dish on top of cake mixture. Bake for 50 minutes. Center will appear runny but will solidify as cake cools. Slice and serve once completely cooled.